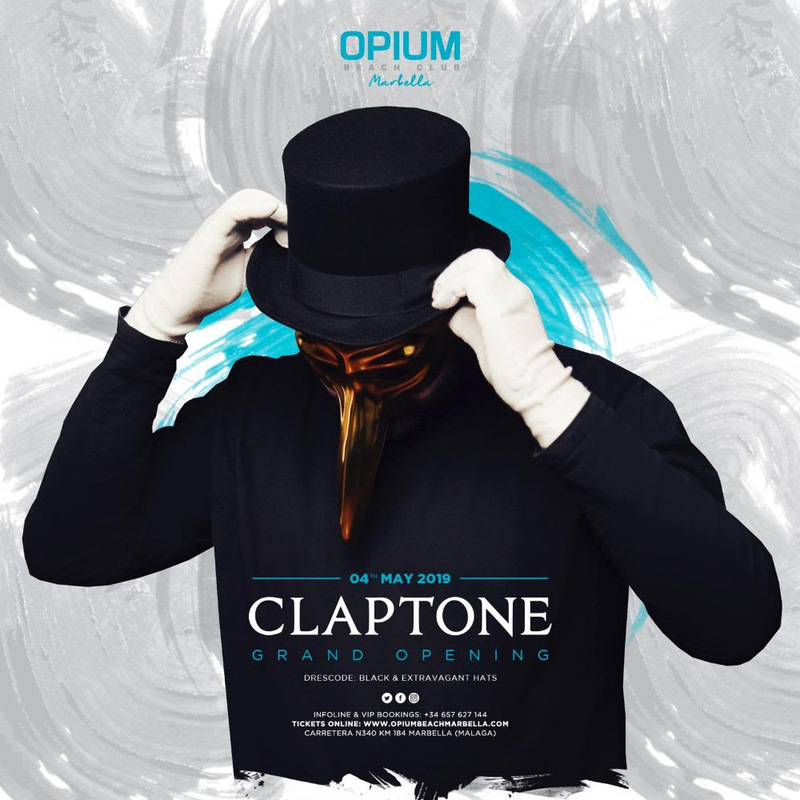 One of the most important leisure brands in Spain, Opium, has announced the performance of the worldwide known German DJ, Claptone, as main feature of the next grand opening of their latest venue in Spain: OPIUM BEACH CLUB MARBELLA, taking place next May 4th. Claptone’s music proposal is outstanding. Anyone that has witnessed the masked artist sessions knows his is an unique show where lightning, visuals and music merge together to bring a truly exclusive experience, making the crowd travel in a truly deep musical journey. Being one of the most elegant and exclusive DJs in todays electronic music, Claptone has his own stages at events such as Tomorrowland or hold residencies in the most select clubs in glamorous cities as Vegas, Ibiza or Paris. This time, to make the crowd a true part of the show and Opium’s grand opening in Marbella, the dress code is strictly black… with the most extravagant hats you can find! OPIUM BEACH CLUB is the most fashionable venue in Marbella. Being a place of reference for day and night leisure, local gastronomy and one of the most privileged beach clubs of Costa del Sol, OPIUM BEACH CLUB MARBELLA has an unique proposal of the most creative and finest international cuisine, plus bar and cocktail services of the highest quality. Located on the beachfront, with spectacular views of the Mediterranean Sea and a chic, minimalistic design, the huge infinity pool and the comfortable terrace – with Balinese beds and numerous VIP areas –, OPIUM BEACH CLUB MARBELLA has the advantages of an outdoor restaurant, a lounge with a relaxed and sophisticated atmosphere and the club where the best music plays and the truly unforgettable parties of the night of Marbella take place, with a cast of renowned international level DJs. OPIUM BEACH CLUB is endorsed by the prestige of the OPIUM brand and experience to the south of Spain, after its well-known and consolidated trajectory in cities such as Barcelona, Madrid or London.